There was a bar and restaurant on property that were both excellent. 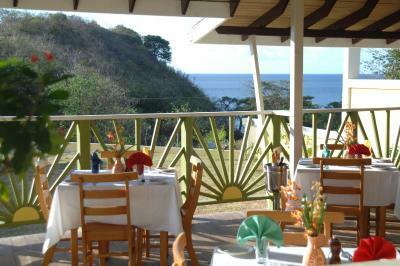 Convenience to the airport, Quiet, Attractive décor Great place to overnight on the way to Carriacou. The staff was extremely nice and helpful. They made my trip enjoyable by going over and beyond the call of duty to ensure that I had a pleasant stay. The only thing I liked about this hotel was the staff....They were very friendly and helpful. 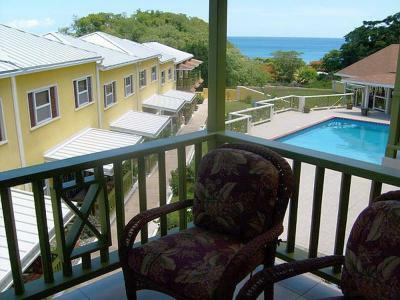 Good service from Staff, we got upgraded free of charge, the location was perfect...closest to one of the best beaches on the island, rooms were very clean and room service was on time. The restaurant was always closed when I went there. The taxi, maid service drivers ever morning at 6 am blowing their hones and shouting loud!!! I liked the location because it was away from the crowds and traffic, however it was a bit remote and the restaurant next door was closed, so that meant there were few options for food locally. I found the staff mostly very friendly and helpful, but a few of the servers in the restaurant were not very friendly at all and the service was slow! Great Staff! Nelissa and Cecil were really nice as were the girls at the front desk. 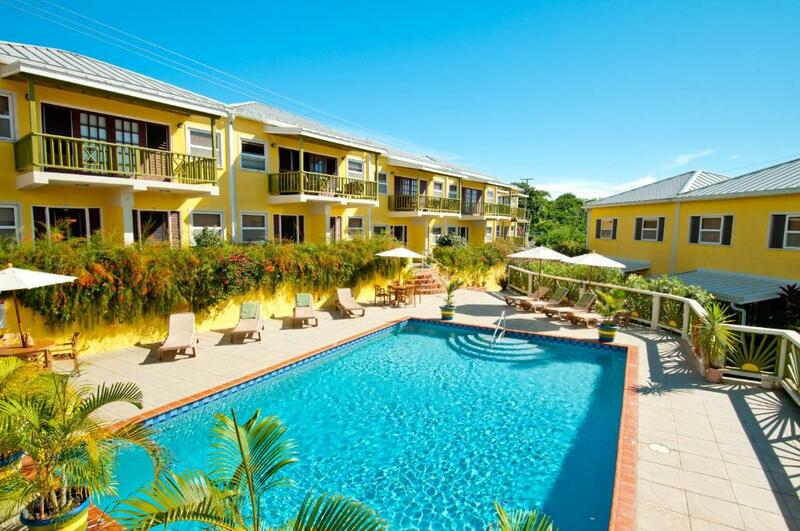 Grooms Beach Villa & Resort This rating is a reflection of how the property compares to the industry standard when it comes to price, facilities and services available. It's based on a self-evaluation by the property. Use this rating to help choose your stay! 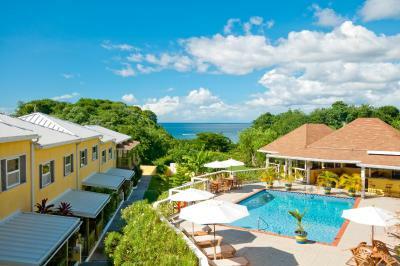 Just a 2-minute walk from Dr Grooms Beach, this tropical resort offers lush gardens and an outdoor pool, overlooking the sea. 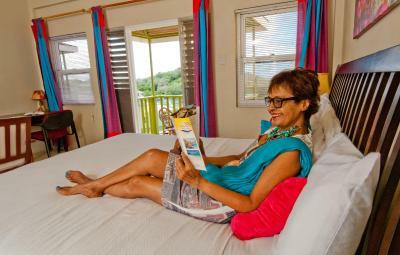 All air-conditioned accommodations offers free Wi-Fi, a fridge and coffee maker. Grooms Beach offers spacious rooms with cable TV and direct access to the poolside terrace. 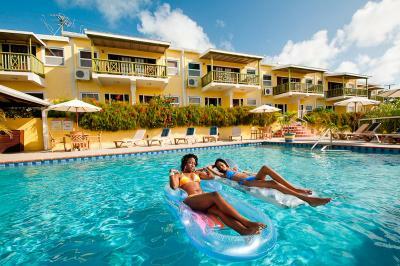 Studios and villas also have well-equipped kitchens and private terraces with sea or pool views. 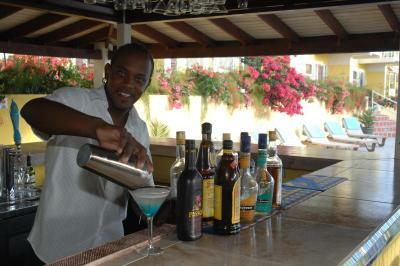 Grooms Beach Villa & Resort has a bar-restaurant with a covered terrace. 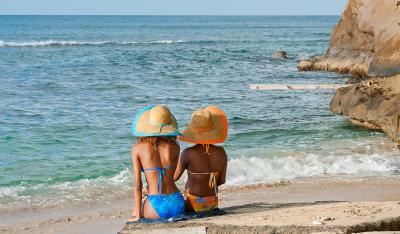 You can also find bars, restaurants and nightclubs in Grenada’s historic capital, St George’s, a 10-minute drive away. 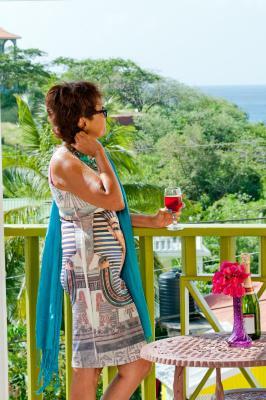 Staff are on hand to provide information about the island, book tours or arrange car rental. 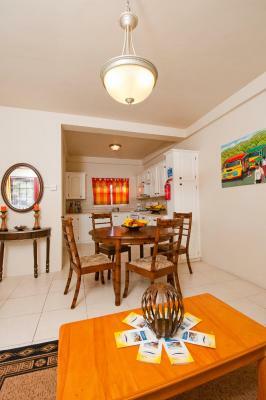 Free parking is available on site, and Maurice Bishop International Airport can be reached in a 6-minute drive. 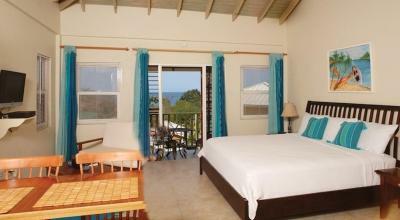 When would you like to stay at Grooms Beach Villa & Resort? 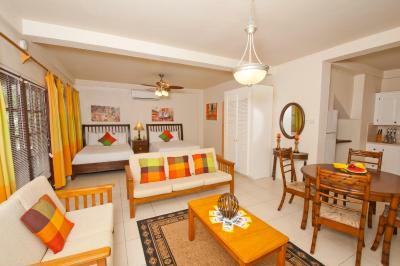 This spacious air-conditioned room has cable TV and free Wi-Fi, as well as a fridge and a coffee machine. 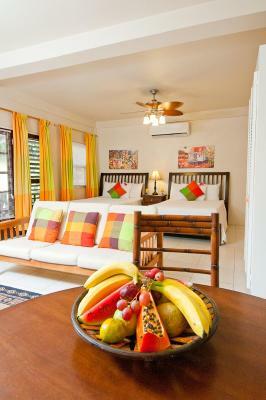 This spacious air-conditioned studio has a sitting area, a breakfast bar and a private terrace with views of the sea or pool. 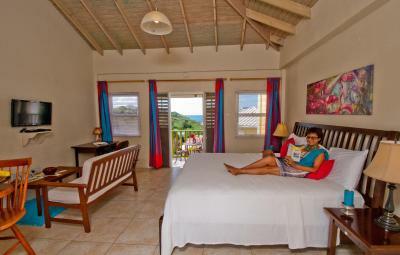 It has cable TV and free Wi-Fi, as well as a kitchenette with an oven, microwave, toaster and coffee machine. 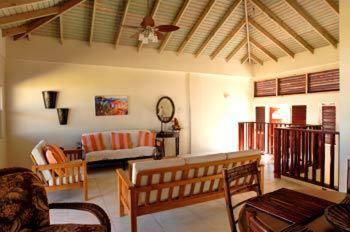 This spacious, air-conditioned villa has 2 bedrooms, an open-plan lounge, a breakfast bar and a large furnished patio with views of the pool. 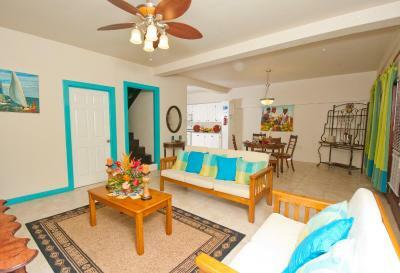 It has cable TV and free Wi-Fi, as well as a full kitchen with an oven, microwave, toaster and coffee machine. Please note that the price is based on 4 guests. Maximum occupancy is 6 (see Hotel Policies for extra guest prices). 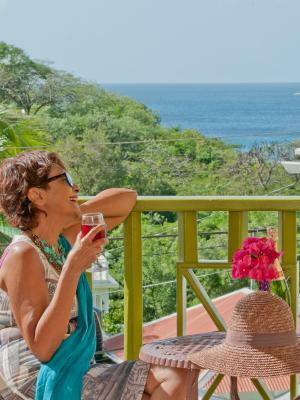 This spacious, air-conditioned villa has 2 bedrooms, an open-plan lounge, a breakfast bar and a large furnished patio with views of the sea. 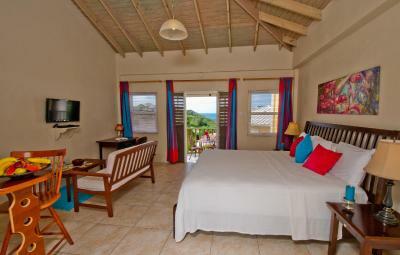 It has cable TV and free Wi-Fi, as well as a full kitchen with an oven, microwave, toaster and coffee machine. 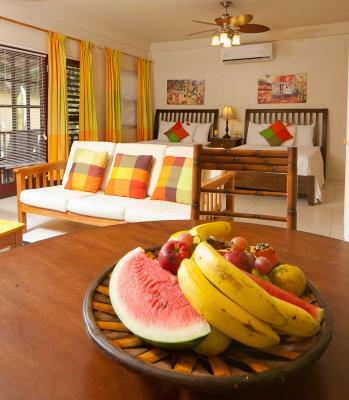 This spacious deluxe studio is attractively furnished in a Caribbean style and comes with a fully-equipped kitchen with fridge, stove, coffee machine, toaster and microwave. 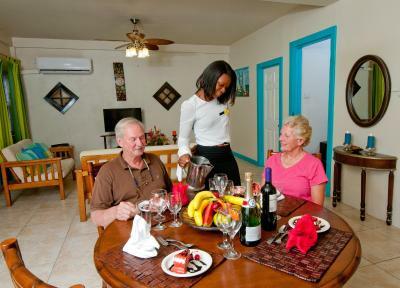 Ironing facilities, cable TV, telephone and dinning/seating area are included as well. .
At Grooms Beach Villas & Resort because we are a boutique hotel we are able to interact closely with our guest thus making them feel welcomed and appreciated. our intimacy also enable us to attend to problems efficiently and immediately. Our main priority is providing excellent customer service. 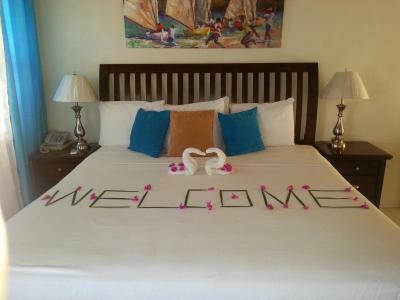 House Rules Grooms Beach Villa & Resort takes special requests – add in the next step! One child under 2 years is charged USD 20 per person per night in a crib. Grooms Beach Villa &amp; Resort accepts these cards and reserves the right to temporarily hold an amount prior to arrival. Grooms Beach Villa & Resort accepts these cards and reserves the right to temporarily hold an amount prior to arrival. Restaurant and bar was not available for dinner or to just sit and have drinks. Extremely loud with all the farm animal near by and staff left our door unlocked for a day when we had to give them the key to clean because they didn’t have a copy. Should always have extra keys. Didn't get off to a good start when I ended up paying a lot more than I thought. This was due to having to pay the hotel in a foreign currency. On booking the rooms, I was given a total price in US dollars, which was far enough, and I was told on the website roughly how many GB pounds this would be. On arriving at the hotel, I had to pay in Eastern Caribbean dollars. Having just arrived in the Caribbean, and having no wifi to check, I had no idea of what exchange rate to expect. I didn't want to kick up a fuss at the time, so I just paid the amount, in EC dollars, in full. Because of the poor rate they used going from US to EC, this resulted in an increased amount of GB pounds. Why the hotel, or Booking.com didn't originally quote the price on their website in EC dollars, I'll never know - but it would've saved a lot of confusion, and money for any unknowing travellers like myself. I've had a similar experience with Booking.com in the past with their 'Pay at the hotel' policy, and so I'll be very reluctant to book with them again. 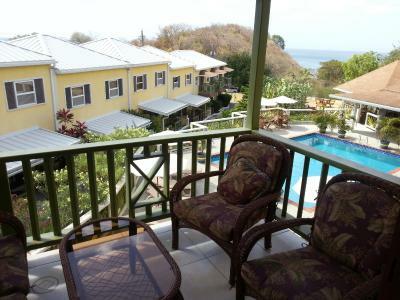 Other bad points with “Grenada’s best kept secret”.....it’s a short distance from the airport and opposite a pub, but otherwise there's nothing else anywhere near. 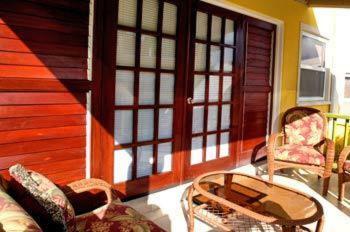 Our very basic ‘Standard Queen room’ (number 220) had a window overlooking the pool and other rooms. On arrival there was no water (burst pipe). Was told it would be working shortly, but at about 11pm we gave up wanting to shower etc and went to bed. Not what you want after 10 hours on a plane. WE HAD TO ASK for a bottle of water to clean our teeth and wash hands with! The room wasn’t cleaned to a high standard on arrival (gritty floor, hairs in bathroom, broken soap bits in shower area - which remained there for 3 days). TV wasn’t working on arrival, but fixed at second time of asking, fridge very noisy and other minor problems. Some were fixed the next day when reported. Struggling to think of anything to say for this part. The guests were nice! The location was quiet and peaceful and the facilities were alright. The staff were pleasant, friendly and helpful. Grooms beach has an abandon look, it is a bit remote, and seems not suitable for bathing. 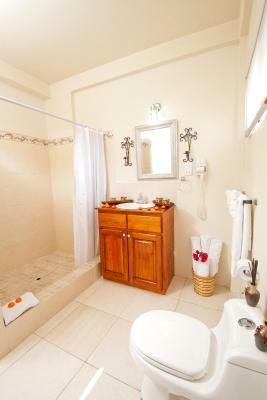 The room was spacious with a full kitchen, good living room space and overall fairly modern. service was very slow even for the islands no available pool towels during the whole 5 days even though we asked pretty much daily. We were eventually given one towel for both of us. Room was very dark-almost cave like. Balcony too small to sit on and metal armless bistro chairs uncomfortable. Very noisy and ugly lot to look at from our corner unit, second floor balcony. It was very disappointing that The Beach House restauraunt is permanently closed. Beach is nice but no chairs. Not much! Staff were friendly. The Cockerell's and dogs were in full swing from 2 am onwards, impossible to sleep. Staff were very freindly and helpful. 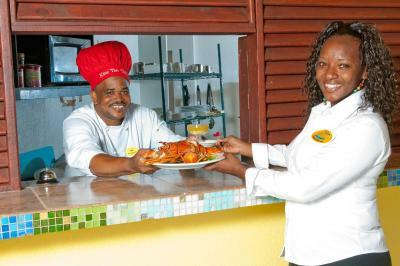 Good breakfast - pool bar facilities excellent - staff very helpful and most interested that we enjoyed our stay. The restaurant closed for dinner half the time, and the wifi was a little week. 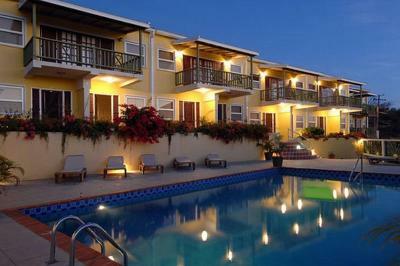 This place is lovely and comfortable, I really enjoyed my stay. The staff was very warm and friendly. The access to the beach.